Item # 309884 Stash Points: 395 (?) This is the number of points you get in The Zumiez Stash for purchasing this item. Stash points are redeemable for exclusive rewards only available to Zumiez Stash members. To redeem your points check out the rewards catalog on thestash.zumiez.com. Accent anything stick-able with signature Primitive style and the Primitive Creation Sticker. 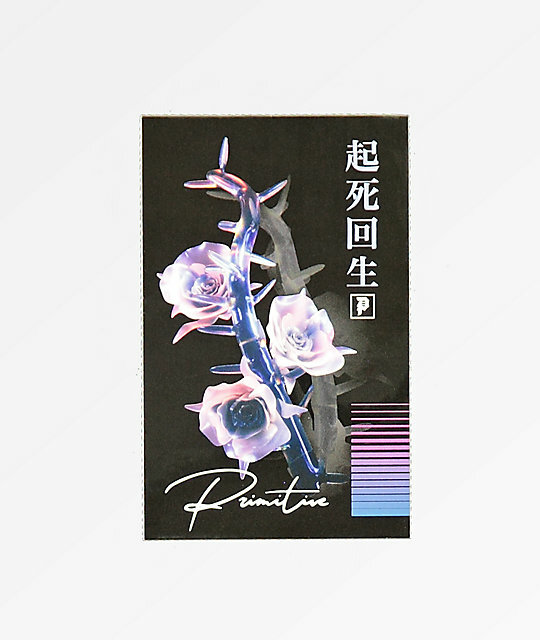 This all black sticker features the image of an abstract purple rose with script logo detailing below and beside it in contrasting white. 2" x 4" | 5cm x 10cm approx. diameter.